Boiler smoke, it is one of the factors affecting the quality of the air, and most of the national industrial boiler have the problems of energy waste and pollution emissions. How to effectively guarantee the safe operation of the boiler is the priority to be solved of the whole industry. How to prevent the boiler exhaust pollutants? Four-Faith developed industrial boiler remote monitoring system with customer, real-time monitor boiler running data, in order to ensure the healthy operation of the boiler, and achieve the lowest energy consumption, emission to a minimum, safeguard, such as equipped with a ‘doctor’ for each boiler. In simple terms, when the boiler let out flue gas , the system will real-time analysis through collecting the data. Environmental protection department will see the data from remote computer terminals. Once any problems with the boiler, such as excessive emissions, the terminal will emit red light indicator. As shown in the topology, the industrial boiler installed with the temperature, pressure, smoke, water hardness, and other sensors. 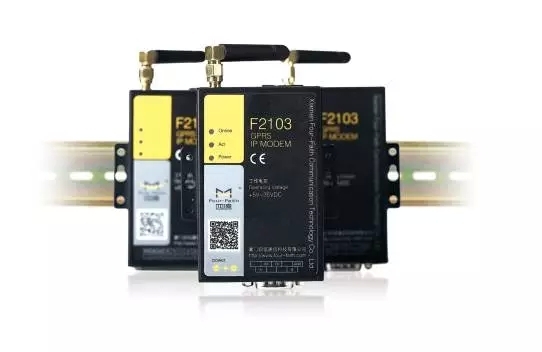 As long as the boiler start-up, these sensors will automatically collect various operation data of boiler, and real-time transmission to the customer's remote monitoring center through the Four-Faith F2103 Industrial IP Modem wireless communication terminal, via wireless network. Management center through analysis of the monitoring index of the system to provide real-time curve, histogram, pie chart, according to reports, etc.. Once found any abnormal or deviation data, the system automatically send mail or information to after-sales service personnel, in time to provide the scheme of treatment. 1. High compatibility: F2X03 support transparent transmission, compatible with different brands and protocol’s boiler. 2. High security: Pass the insulation resistance, dielectric strength, surge interference and electrostatic discharge interference, high and low temperature, radiofrequency radiation electromagnetic field, power frequency magnetic field and other indicators, meet or surpass the related national standards, ensure the stability of the monitoring system of boiler. 3. 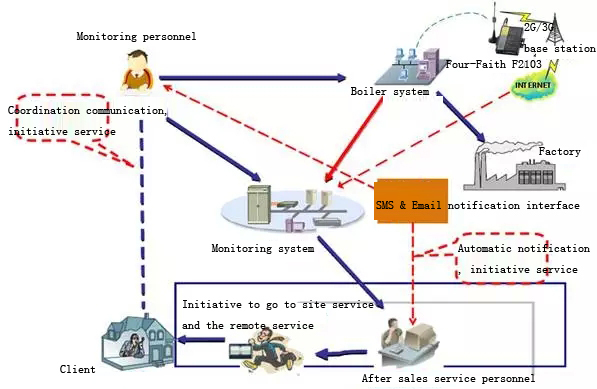 SMS alarm: support SMS alarm function, will send SMS to the related person if equipment abnormal, convenient for maintenance personnel to quickly response. 4. Remote management: PC software can reverse control, parameter configuration and remote upgrade the on site equipments by F2X03, improve the efficiency of management.